NETWORK FINALS: MAGNUM PI gained 0.1 in final numbers. 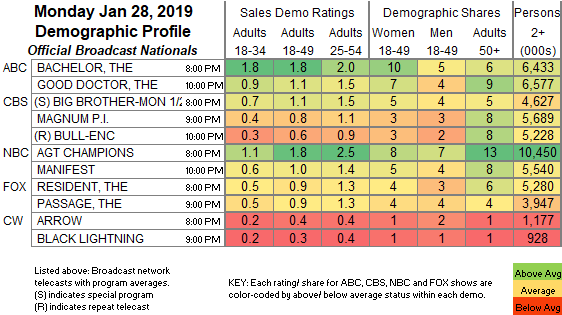 CABLE HIGHLIGHTS: The official series premiere of I AM THE NIGHT was a rerun of the previous night’s “sneak peek,” so isn’t on the chart below. Once again it was simulcast on TNT and TBS, where it was respectively at 0.21/1M and 0.24/654K. USA’s WWE telecast was at 1.00/0.95/0.90 compared to last week’s 0.95/0.85/0.77. On VH1, LOVE & HIP-HOP dropped 0.09 to 0.63, and CARTEL CREW was down 0.06 to 0.34. On MTV, TEEN MOM ticked up to 0.60, and MADE IN STATEN ISLAND was down 0.03 to 0.17. Bravo’s VANDERPUMP RULES gained 0.04 to 0.57. CNN’s TOWN HALL with Kamala Harris gave it an easy cable news win at 0.44/0.59/2M, with MSNBC’s RACHEL MADDOW SHOW at 0.34/0.52/3.3M, and Fox News’s HANNITY at 0.24/0.45/2.9M. ESPN’s COLLEGE BASKETBALL doubleheader was at 0.43/0.23. On Food Network, KIDS BAKING CHAMPIONSHIP lost 0.07 to 0.38, and WINNER CAKE ALL was down 0.05 to 0.19. Discovery’s STREET OUTLAWS edged up 0.02 to 0.36. 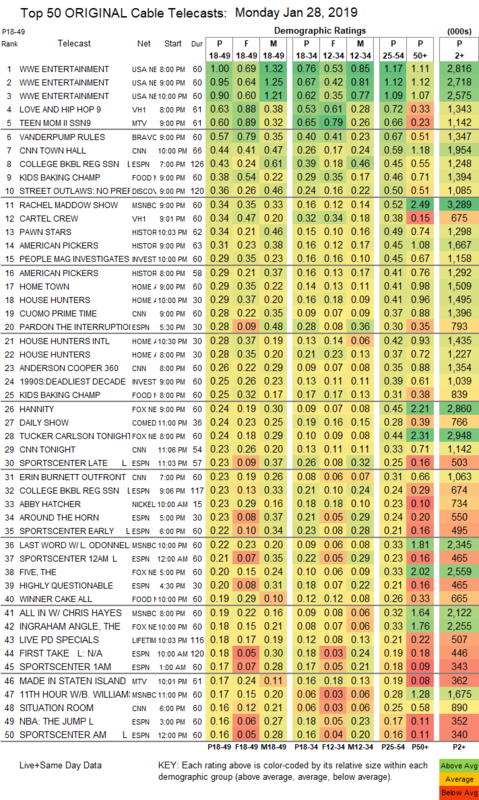 On History, PAWN STARS climbed 0.12 to 0.34, and AMERICAN PICKERS ticked up to 0.31. On ID, PEOPLE MAGAZINE INVESTIGATES slipped 0.02 to 0.29, and DEADLIEST DECADE was at 0.25. On HGTV, HOME TOWN was steady at 0.29, HOUSE HUNTERS was at 0.29/0.28 compared to last week’s 0.32/0.29/0.28, and HOUSE HUNTERS INTL was up 0.03 to 0.28.